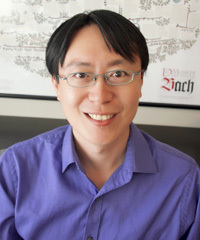 Ming-Lun Lee received his PhD in historical musicology and music theory from the University at Buffalo, as well as master’s degrees in electrical engineering and musicology from National Taiwan University. Lee has completed several studies on the analysis and aesthetics of classical recordings, including his PhD dissertation “Britten Conducting Britten: A Study of the Recordings Produced with John Culshaw.” He has presented papers at the American Musicology Society Annual Meeting, Buffalo Graduate Symposium on Music, and University of Toronto Music Graduate Student Association Conference. With teaching and research experience in both electrical engineering and musicology, Lee is well fitted to the interdisciplinary nature of the Audio and Music Engineering program. He is devoted to audio programming using a variety of programming languages, including C/C++, Objective-C, ChucK, Csound, Faust, Max/MSP, Pure Data, SuperCollider, and Swift and is particularly interested in programming for interactive multi-media performance. His AME/ECE courses include Audio Software Design I & II, Interactive Music Programming, Intro to C/C++ Programming, and Revolutions in Sound: Artistic and Technical Evolution of Sound Recording. His other areas of research interest include audio preservation, the art of classical recording production, Benjamin Britten’s recorded legacy, and the computational analysis of musical performances and recordings. In addition to his academic research and teaching, Lee is an active choral conductor and baritone. He is currently music director of the Chinese Choral Society of Rochester and vocal coach of the Taiwanese Choral Society of Rochester. He studied choral conducting with Chia-fen Weng and voice with Chung-kung Lin and Chi-ling Hong. He has also participated in many choral conducting master classes with distinguished mentors, including Dirk DuHei, Gábor Hollerung, Edward Maclary, Robert Page, Oimer Suitner, and William Weinert. Lee has appeared as a guest conductor with the Chin-Yun Chorus and the National Defense Medical Center Choir, and as a baritone soloist with the Chin-Yun Chorus, the National Taiwan Normal University Music Department Chorus, and the University at Buffalo Choir.